Uzbekistan first competed as an independent country in the summer Olympic Games in 1996 in Atlanta, where athletes picked up two silver and three bronze medals in judo and boxing. At the 2004 Olympiad in Greece, Uzbekistan won two gold medals, one silver and two bronze to finish 34th out of 201 competing countries. This year 18 Uzbek women and 36 Uzbek men, including champions of previous Olympics and world championships, will compete in gymnastics, cycling, swimming, track and field, weightlifting, rowing and canoeing, boxing, judo, taekwondo, wrestling, shooting, and tennis. Ruslan Kudayev will be the first Uzbek to ever compete in fencing. The Uzbek government heavily promotes sport throughout the school system and continues to construct modern sports facilities. Olympic medalists are also awarded cash prizes by the government. Like its neighbour, Kyrgyzstan's first appearance at the Olympics was in 1996. Its Olympic medal tally to date is three, in judo and wrestling. Three Kyrgyz women and 11 men will participate in the games. Kyrgyz athletes train at a dedicated Olympic Training Centre in Bishkek. The small republic is pinning its medal hopes on 19-year old Aisuluu Tynybekova in the women's freestyle wrestling. 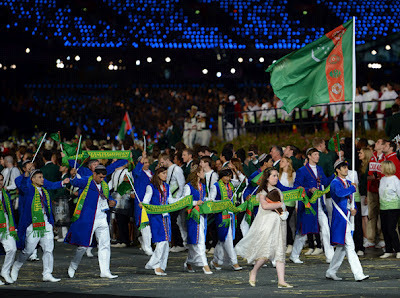 Turkmenistan is hoping for its first Olympic medal since its debut as an independent country at the 1996 summer games. Its 10-member team (three women and seven men) will compete in athletics, judo, boxing, swimming and weightlifting. Hoping to attract international sporting events, Turkmenistan has embarked on the construction of a vast sporting village and training centre. The new project is to include 30 sports facilities and a football stadium with a capacity of 60,000 people. The New York Times piece today on Turkmenistan's 18-year old swimmer, Jennet Saryyeva, demonstrates how much it means for athletes from developing countries to participate. Follow Uzbekistan's, Kyrgyzstan's and Turkmenistan's Olympic results online. You will delight locals if you mention their sporting heroes when you travel there. 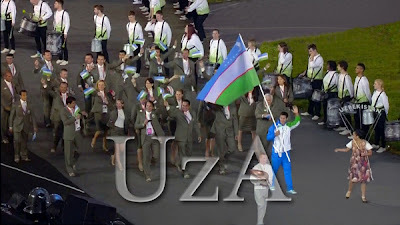 Update 14 August 2012: Review this link for a wrap up of Central Asia's Mixed Success at London Olympics.